Once upon a time a sassy and gifted young woman from rural Pennsylvania was offered a job at a fancy art studio in New York. So she parceled up her things and trekked to Brooklyn to begin her shiny new adventure as an artist in the Big City. A short while before our heroine made her big move, a serious and very talented young man from Utah also packed up his belongs and pencils and brushes and journeyed to Brooklyn to begin his career as an artist at the very same fancy art studio in Manhattan. Fast forward almost three years to a beautiful, sunny day in June. From a rooftop in Easton, PA to a meadow to the old Art Deco Bank Street Annex, these two amazing artists committed to join forces and to love, support and wash away the dust from each other's souls for the rest of their days. It was one of the most magical weddings I have ever attended. Kelly and Spencer specialize in typographics and have a penchant for Art Deco and Art Nouveau, so I made Kelly's bridal bouquet reminiscent of the large, cascading bouquets of the 1930s. Her dress was very Jean Harlow - perfect. 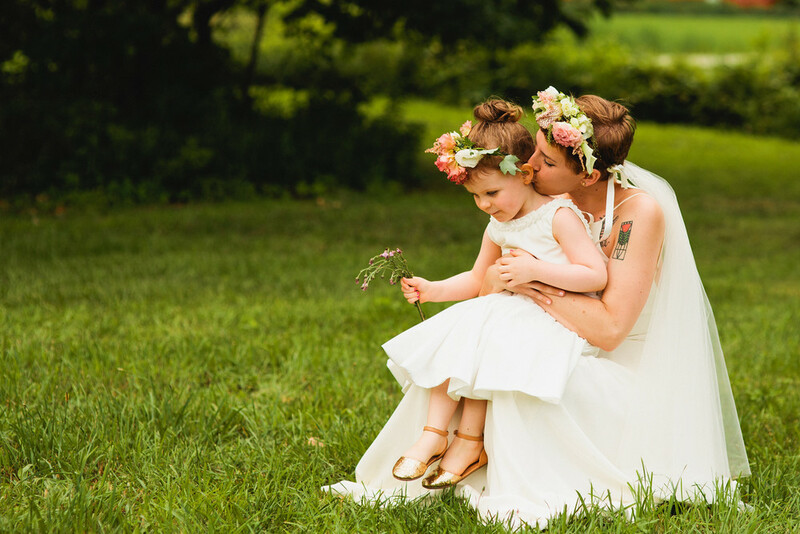 Matching flower crowns for the flower girl and bride. 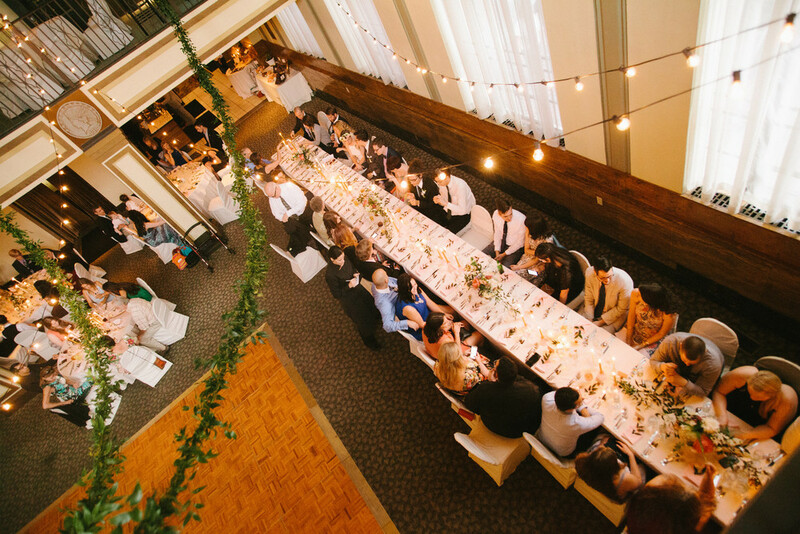 The wedding reception was at the Bank Street Annex in charming Easton, Pennsylvania. The bank had some really unique Deco details that the couple loved. They wanted the main room to have the feeling of an Italian street wedding, so we strung Italian Ruscus garlands and cafe lights from the balcony. This space was a challenge, but this is why I love event styling. The candlesticks were pink depression glass with napkins to match. To honor the couple's cat, Cricket, tiny golden cats were sprinkled all over the tables. Cricket also made an appearance on the amazing gold emobssed wedding invitations they designed. The wedding favors were pins designed by Kelly and Spencer with the state flowers from Pennsylvania and Utah. I wear mine proudly. I designed the centerpieces for this wedding to stretch and fill the space. I love how delicate they are. The golden compote summer wedding centerpieces were lush and dreamy. I used all the romantic flowers including charm peonies, garden roses, Japanese lisianthus and lilies. They danced the night away as if they were the only two people in the room. I couldn't take my eyes off them.